1. Cut the styrofoam ball in half and make sure it fits the middle inside of lid. Trim or shave edges as necessary. 2. Place figurines on Styrofoam and place jar over lid to check height. You may need to shave off some of the Styrofoam to make figurines fit in the jar. 3, When satisfied with position and height of figurines, super glue the pieces in place on Styrofoam (should be done by adult). 4. While the glue is setting, fill the empty jar almost to the top with cool tap water. 5. 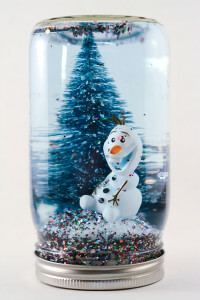 Test water level by inserting the lid with the figurines into the jar of water, tighten, and turn upside down. Make sure the water level is over the top of the figurines with a little room to spare at the top. 6. Remove the lid and add desired amount of glitter to the water. Stir. 7. 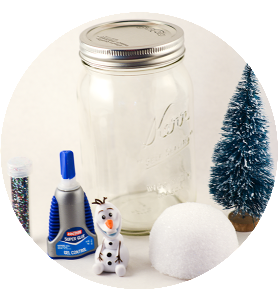 Before placing the lid back onto the jar, prepare a seal with the hot glue gun by running a ring of glue around the inside of the lid, then quickly closing the lid on the jar and tightening. 1. Blow up balloon to size of ornament you would like and tie. 2. Wrap Cling Wrap around balloon. This prevents the twine from sticking to the balloon. If it does not “cling” enough, tape the edges with scotch tape. 3. Hold the end of the jute twine to the base of the balloon (or tape down) and start wrapping the twine around the balloon. Once you are satisfied with the wrapped balloon, bring your twine to where you started and hot glue the two ends of the jute twine together. 4. 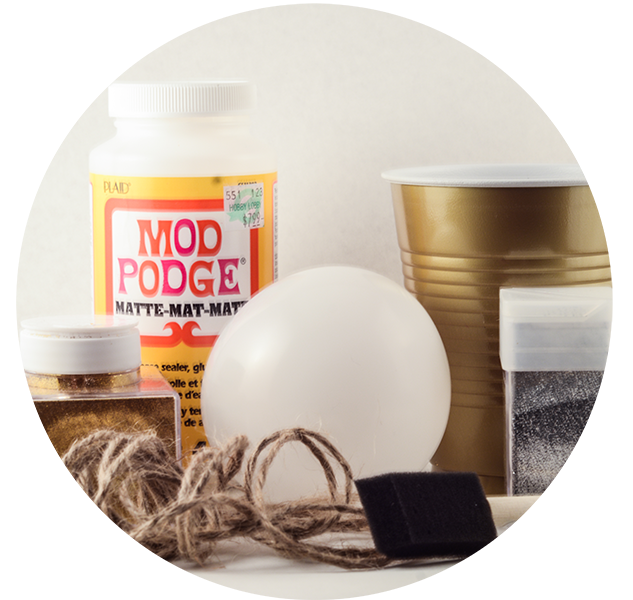 Pour some Mod Podge into a plastic cup and mix in glitter as desired. 5. 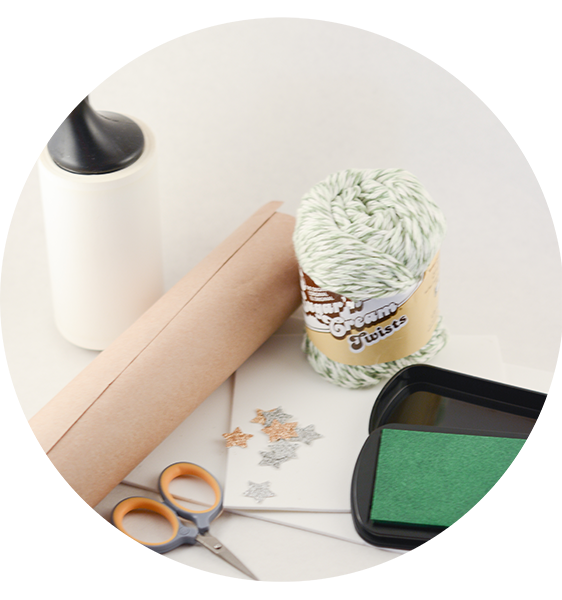 Using the foam brush, generously paint the twine with the glitter Mod Podge, making sure to cover all of the twine. 7. 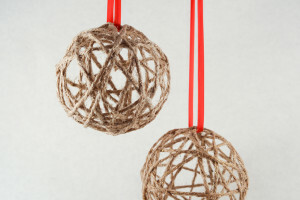 Once completely dry, pop the balloon and carefully remove it, along with the cling wrap, through the openings in the twine. 8. Attach ribbon, thread or wire ornament hanger of your choice. 1. 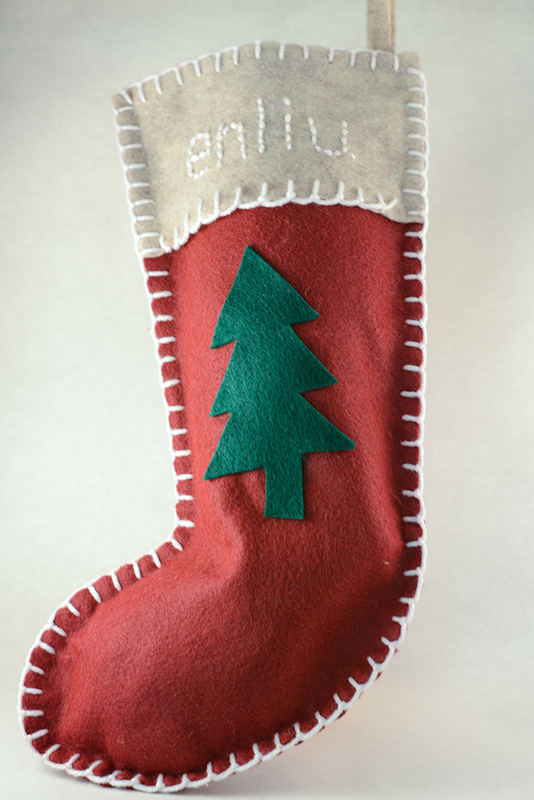 Cut out 2 pieces of felt for the stocking using any size or pattern you would like. We found a free pattern on Pinterest. 2. Cut out 2 pieces of felt for the cuff. 3. Match the cuff to the outside of the stocking and pin. 4. Thread the needle and knot the end of the yarn. 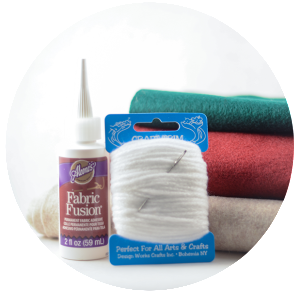 We suggest measuring about 3-4 times the length of the outside edge of your stocking to determine the length of yarn. 6. Blanket stitch each cuff’s top edge to its corresponding layer of stocking felt. 7. Blanket stitch the bottom edge of the cuff. Do not stitch it to anything, as this is just for decoration. stitching the name into the cuff only. 9. Cut a small piece of felt for the loop to hang the stocking. Fold it in half and sew it to the inside corner of the stocking. 10. 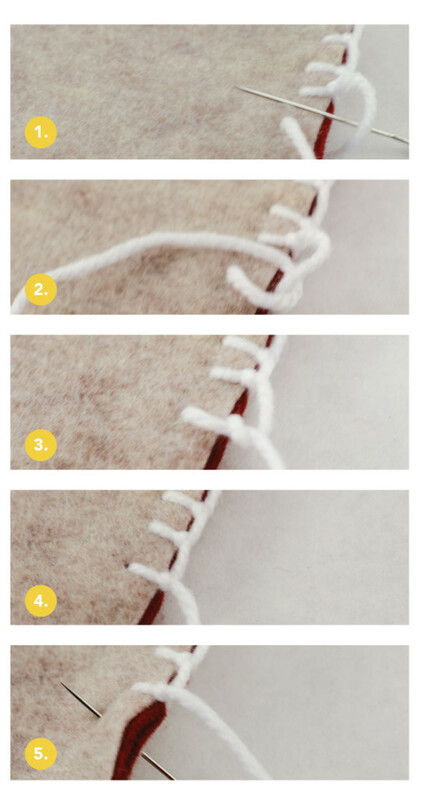 Determine a shape for your accent and cut it out of another color of felt. 11. Use the fabric glue to attach the accent shape to the front of the stocking, and let dry. Be careful not to soak the felt, as the glue will show through as it dries. 1. Determine a stamp design for lint roller. 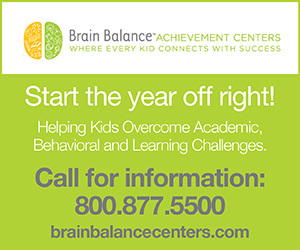 For our design, we used trees and ornaments, and simply printed the images on plain paper for a pattern. You could also freehand a design. 2. Cut out stamp design on craft foam. We taped the pattern to the foam to ensure our designs were accurate. You could also draw the design on the foam before cutting. More detailed shapes may require a tiny pair of sewing scissors or an X-Acto knife. 3. Ensure your lint roller has a fresh sheet exposed and place the foam stamps on lint roller. Be sure there are no large gaps around the roller or your roll will be uneven. 4. Press the roller onto ink pad, making sure that the foam stamps are completely covered with ink. 5. Test roller on a scrap piece of paper to get a feel for how much pressure to apply. 6. 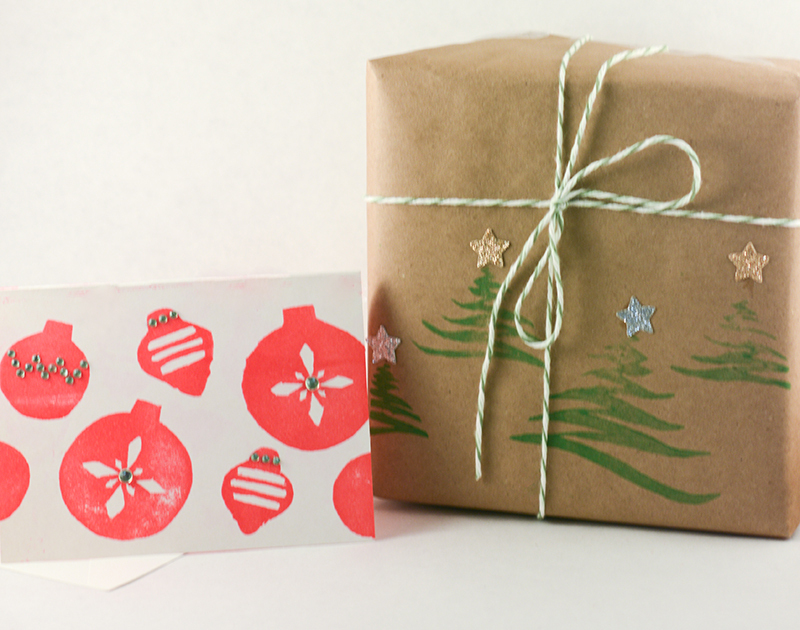 Once you get the hang of it, roll stamps with ink onto Kraft wrapping paper or card. Let dry. 7. If desired, add accents to the print. enliu is an Orange County-based company specializing in homemade crafts and décor that can be customized or personalized to create one-of-a-kind gifts, wedding favors and more. Founder Jessica Liu began selling her designs on Etsy about a year ago and, with the help of longtime friend Vanessa Oddo, enliu has bloomed. Find enliu’s homemade items at etsy.com/shop/enliu or email shopenliu@gmail.com.